Of seven Naxos audio books in my possession, five are read by Juliet Stevenson, the actress who so brilliantly portrayed Mrs. Elton in 1996’s Emma and whose comical performance as Keira Knightley’s cleavage loving mother in Bend it Like Beckham is my favorite character in the film. A Voice Crafter’s article describes the characteristics of a good audio book reader: A vocal talent suitable for reading a novel has to be able to hold people's attention for long periods of time—hours and hours if need be. They must be able to use their voices to create a certain ambience, to make narration sound different from dialogs, and slightly distinguish between characters without sounding silly, unless, of course, they need to sound silly. They have to have the sort of voice that is not grating, yet not so soothing that it puts people to sleep. They should be able to evoke feelings of warmth, or of anger, or fear. Whatever is appropriate in the course of the tale, or radio drama podcast. In her interview Juliet reveals why she likes reading for audio book: “You can play anything – an old man, a girl of seventeen. It is really liberating but it is also difficult.” Being able to take liberties with characterizations also attracts her to the medium. In order to be an effective reader she must know the heart and soul of the book, an experience Juliet found enriching. 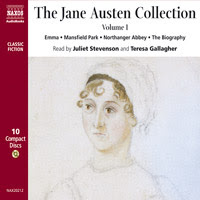 View the Jane Austen collection in the Naxos audio book library. Click on the audio sample to listen to Juliet read Emma. Naxos has also been featuring audio books of Charles Dickens novels, including Little Dorrit. Click here. You can listen to audio readings of Jane's novels at Librivox. While these recordings are free, the vocal readings are generally amateurish. There are some exceptions, Karen Savage is an outstanding example, but generally the quality of the reader is not guaranteed at this volunteer reader site. She is a wonderful actress and I'm glad to know of these recordings too ! She is a superb actress. I must say this is one of my fav blogs. Just thought I'd let you know. I'll have to check out the recordings. Thank you, Kathleen Marie. And thank you for your continued support, Lynn. Your support and compliments mean a lot. "Two of my favorite readers are Maria Burton, Richard Burton’s daughter from his first marriage, and Campbell Scott, the son of George C. Scott and Colleen Dewhurst." Maria Burton is not Burton's daughter from his first marriage. Maria's mother is Elizabeth Taylor, Richard Burton's second wife.